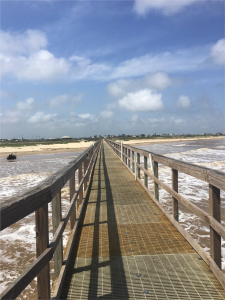 Image looking at the coastline of Matagorda. From this perspective it is possible to see the flatness of the land, which corroborates historical documents highlighting both the richness of the soil and the destructive capacities of hurricanes and tropical storms. 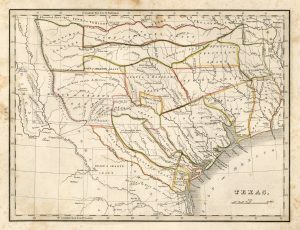 Welcome to Mapping Texas Slave Trade Routes. This website offers a digital visual history of Matagorda County by photographing archival documents and historical sites in the region. It expands on contemporary understandings of slavery in Texas during the late eighteenth and early nineteenth centuries by highlighting Matagorda as a dominant city (and eponymous county) for commerce, as well as a primary entry point for enslaved people in early Texas history. When appropriate, it also emphasizes Bay City, the county seat founded in 1894 situated between Caney Creek and the Colorado River. The county’s unique position stretching towards the Gulf of Mexico and along major waterways headed inland mark Matagorda as necessarily crucial to slave trading in Texas. Not only does this project position Matagorda centrally within historical narratives of slavery in Texas, but it relies on everyday artifacts — contemporary maps, memorabilia, paraphernalia, oral tradition, and even the reconstruction of historical routes via photographic documentation — to showcase the continuity between the past and present in this region. By documenting history through written texts, cultural remnants, and intangible memories, conversations, and reflections, the researchers involved in this study constantly commit themselves to pushing the boundaries of what is knowable through various historical records. Through such probing they hope to shed light on an oft overlooked time period and region in Texas history. Ultimately, then, this website illuminates the lasting legacy of slavery in the region and provides valuable information available to historians, researchers, and students. We are an interdisciplinary team of scholars, historians, and archivists at The University of Texas at Austin studying eighteenth and nineteenth century slave life and slave trading in and around the Texas region. Combined, we have more than three decades of archival experience and each contribute a range of specializations to this project. From issues of gender, race relations, and border crossings to pedagogy, public scholarship, and oral history, our team represents myriad interests, strengths, and perspectives that have proved immeasurably useful throughout this project. From Comprehensive Atlas, Geographical, Historical and Commercial by Thomas Gamaliel Bradford, 1835. Courtesy of the Dorothy Sloan-Rare Books, Austin, Texas. From the Perry-Castañeda Library Map Collection. This project was made possible by generous support from the Humanities Media Project at The University of Texas at Austin. Within the university, additional support came from the College of Liberal Arts, the African and African Diaspora Studies Department, and the Department of History. This website is dedicated to Mr. Clifford Rugeley, a lifetime resident of Matagorda, Texas. Mr. Rugeley was essential to our research and fieldwork in the Matagorda region. His kindness, dedication, knowledge, and humility continue to inspire. Image of Mr. Clifford Rugeley posing beside the historical marker for Mt. 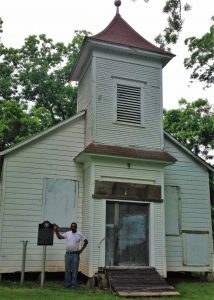 Pilgrim Missionary Baptist Church. Photo taken in May 2016. Permissions: All of the images presented on this website were taken by the research team, are available in the public domain, or have been used with permission. The research team does NOT own the rights to any of the images obtained from archives or other repositories.